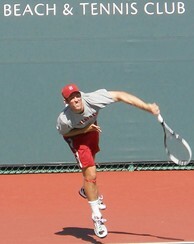 Stanford's Ryan Thacher prepares to serve during the Pacific Coast Men's Doubles Championships. Bradley Klahn follows through on his serve at the La Jolla Beach & Tennis Club. LA JOLLA, Calif. – Another chapter will be written in the long history of the Pacific Coast Men’s Doubles Championships as the tournament comes to a close on Sunday with the semifinals and championship scheduled to be played at the La Jolla Beach & Tennis Club. Sunday’s schedule will begin with the first semifinal at 9 a.m. (PT) as Warren Hardie and Clay Thompson of UCLA will face the independent team of Kris Kwinta and John Peers. At approximately 10:30 a.m. (PT), the second semifinal match between defending champions Bradley Klahn and Ryan Thacher of Stanford and Sebastian Fanselow and Jenson Turner of Pepperdine will take place. The championship match, which will feature the winner of each semifinal match, will begin at approximately 1 p.m. (PT). On Saturday afternoon, Klahn and Thacher got through a tough first set in their quarterfinal match against Chasen Melton and Ben McLachlan of UC Berkeley (Cal) and went on to score a 6-4, 6-1, victory to advance to the semifinals. If Klahn and Thacher win the championship on Sunday, they will be the first team in over 20 years to win back-to-back titles at the Pacific Coast Men’s Doubles Championships. The last team to accomplish the feat was Stanford’s Jared Palmer and Jonathan Stark, who won the Pacific Coast Men’s Doubles Championships in 1990 and 1991. "I’m really happy with the way we’ve been playing…we’ve been getting a little bit better each match so far. We’re looking forward to the semis tomorrow," Thacher said following the quarterfinal victory. "One of our strengths at this point is our experience together. We’ve been playing as a team for two and a half years now, so we have a good feel where each other is going to be on the court. When we’re returning and serving well, that gives us a big advantage," he added. Even though many athletes don’t like to look ahead when they play a tournament, Thacher said he and Klahn came into this year’s tournament with the expectation and hope that they would be in the position to win a second consecutive title. "It would be a great honor with all of the names who have played this tournament throughout the years," Thacher said. "To win it one time was awesome and to have the chance to be in there for a second is icing on the cake." Spectator admission to the 123rd Annual Pacific Coast Men’s Doubles Tennis Championships is free and open to the public. On-site parking is available for a nominal fee.